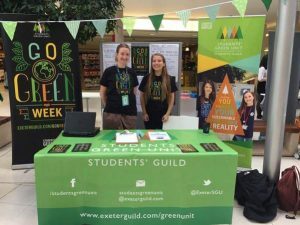 In this week blog, we have asked our Sustainability team to provide some information about Go Green Week which will be taking place next week; tell you about your chance to take part in Student Switch Off and finally, let you know how to provide feedback about living in University residences this year through the Student Living Experience survey. The University and the Students’ Guild are teaming up with a range of student societies, academics and local community members to deliver Go Green Week 2019. This 5-day event – running from 18-22 March across the Exeter campuses – will offer a jam-packed programme of events and activities around sustainability and the environment. Climate change. Peak oil. Wildlife extinction. There are many big issues we face as humans today. Luckily people all over the world are doing some amazing work to tackle these problems, and we would like to share some of this with you – and give you opportunities to join in. The aim of the Go Green Week is to raise awareness of environmental issues such as climate change, whilst supporting people to take positive environmental action in their own lives and communities. There are even opportunities to learn some nifty skills to green up your life. Full details on the week and the programme can be found here and the wide range of activities on range include: film screenings; environmental talks; surplus food collections; bike checks and maintenance workshops; community garden visits; a solar charger-making workshop; and free hot drink giveaways for those with reusable cups. You can also find out about some exciting student-led projects, extra-curricular opportunities and other local groups at the information fair each day in the Forum. and a Guild staff member will be in touch. In addition, aligned with Go Green Week activities, the Guild are looking for Project Leaders for on-campus and off-campus Green Projects. If you are interested in these roles you can fill out the application form here. The four top halls from across the UK that take the climate change quiz will win a delivery of 50 big tubs of Ben & Jerry’s! You may have learned something in quiz last term’s quiz, but now there are 6 new questions to get you thinking more about climate change, climate justice and energy saving. Student Switch Off are also giving away 1 litre’s worth of Ben & Jerry’s ice cream (any flavour) to a winner who takes part at the University of Exeter with other local prizes including iTunes vouchers and KeepCups. Well done Lafrowda NPQR who were one of our four winners last term, so can Exeter students pick up one of the top spots again? Remind me – what’s Student Switch Off? Student Switch Off is the energy-saving competition on campus to reduce energy waste in halls. The hall that has the most engaged students working to save energy by the end of this year will win an additional big delivery of Ben & Jerry’s! You can see how you’re doing so far in the mid-year leaderboard here. We have recently written to all residents to ask them for feedback on their time in residences by completing the Student Living Experince survey. The results we receive from this allow us to review our services and make improvements both for current and future residents. If you complete and submit the survey you will be in with the chance to win £50.00 of Amazon vouchers. Next week we will be reminding you about what you need to do for the Easter vacation and about the Easter Egg Hunt. This entry was posted in 2018/19, Current residents, Events on campus, Postgraduate, Residences, Uncategorized, Undergraduate and tagged 2018/19, postgraduate, undergraduate, what's going on. Bookmark the permalink.